With Pennsylvania  home to one of the highest number of military veterans in the nation and 50,000  calling the Allentown region home – our non-profit is dedicated to growing the most impactful annual veterans’ Memorial Day weekend event in Pennsylvania. Held on historic military grounds in a city, Allentown, which is deeply connected to our nation’s military history, this veteran focus will be the keystone of our Annual Statewide Celebration showcasing Pennsylvania’s Music and Arts from traditional to emerging. 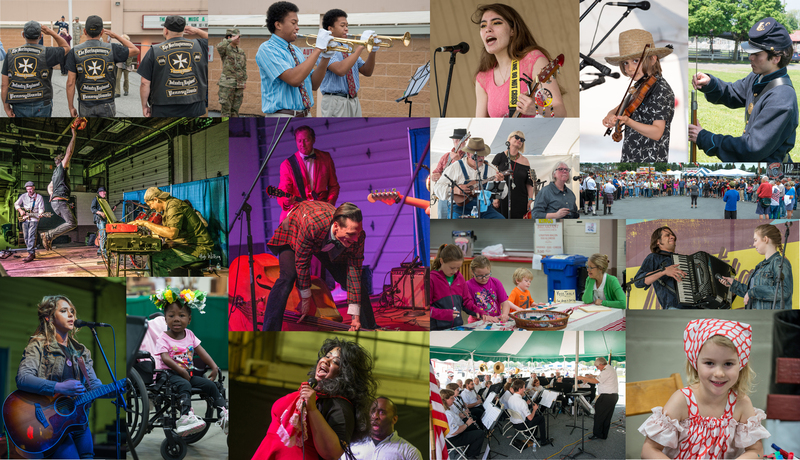 In 2018, on the 100th anniversary of WWI and Camp Crane, The Inaugural Great Pennsylvania Music & Arts Celebration was held at these historic Allentown Fairgrounds throughout Memorial Day Weekend 2018 – free and open to the public, maximizing attendance from the Lehigh Valley and surrounding areas. We look forward to presenting our second annual celebration in May 2019! DEDICATED to PA and U.S. Veterans while educating on their contributions to U.S. Military History: As a non-profit dedicated to PA musical and arts traditions, in a state with one of the highest veteran communities in the nation and one of the richest military music traditions in the U.S. and its headquarters in a region that 50,000 veterans call home – PAMPS takes extremely seriously its role in making positive contributions to veterans and educating the general public on our nation’s military history. The annual Great Pennsylvania Music & Arts Celebration will honor veterans of yesterday, benefit the veterans of today, showcase the servicemen and servicewomen of tomorrow, and celebrate military music traditions by featuring the nation’s oldest civilian military band and their colleague bands that make Allentown “Band City USA”! “Veterans in Pennsylvania”; December 11, 2017; retrieved January 2, 2018; www.workstats.dli.pa.gov. “Why Lehigh Valley Military Affairs Council Was Created”; retrieved January 2, 2018; www.lvmac.org.